Amanda Kovattana: Are We Green Yet? 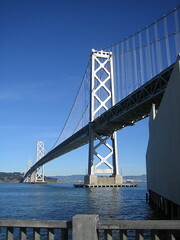 In reference to the oil spill in the San Francisco bay, two days after the collision of a freight tanker with a pier of the Bay Bridge, the Chronicle offered a one word headline: "Heartbreaking". How odd, I thought. I'd never seen a newspaper get so emotional. The picture that went with the headline showed a six column wide close-up of an oil-covered bird. The week before, the Chronicle had done a front-page article on the plastic garbage patch in the Pacific. Yay, I had shouted to Catherine. Never before had bad news looked so good to me. It was only a little over a year ago that I had learned about the garbage patch and created my "Why Bottled Water Makes Amanda Cranky" display. In 2004, when I first wrote about global warming as a concern, it took three years for the Chronicle to take the subject seriously. Now, the knowledge gap was closing and suddenly Green was in. The CNN series, Planet in Peril, impressed us with its depth. MSNBC declared that it was now a Green station. This did evoke some skepticism. Had they just now figured out how to recycle? Meanwhile the atmosphere at the Bioneers conference in October had been decidedly grim. Evidence of planetary woes was compounded by corporate mayhem in Burma to put in an oil pipeline, the never-ending war in the Middle East and the ever more obviously egregious conduct of the Bush administration. This should have been a time of large-scale action to reduce our carbon footprint, but instead we were in the midst of a resource war for oil, the very substance that was causing so much devastation. The tanker that had caused the oil spill was piled high with containers thus serving as a vivid reminder of world consumption and the dramatic increase in shipping in the last few decades, inviting the inevitability of accidents along with the usual cost to the planet in pollution and fuel extraction. As this was an outgoing tanker, the containers were probably filled with bails of crushed plastic bottles and e-waste going overseas for recycling as opposed to new plastic crap, cheaply made clothing and next year's e-waste. One TV newscaster did mention that some of the containers were filled with perishable food and would need to be unloaded quickly. A fitting example of why it would be a good idea for communities to localize food sources. It was a good week to return to the Green Festival. There, at least, we could buy something free of guilt (we hoped). Created after the pivotal protest against the World Trade Organization in Seattle, the point of the Green Festival was to show the world what fair trade, sustainably produced goods looked like. With the Gap having recently been busted for using child labor (followed by earnest statements from the CEO that this was not okay), it was a good reminder that fair trade still had far to go. 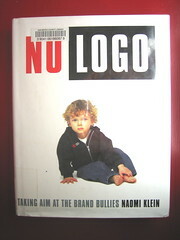 I happened to be reading Naomi Klein's first book, No Logo. Sweatshops, I learned, were systemic and not an aberration that cropped up now and then to mar a company's image. Corporations had distanced themselves as much as possible from actually making things. They were now all about branding and slapping their label on goods made for them as cheaply as possible. Contractors competed with each other to get those everyday low prices for them. This had created what were basically indoor work camps all over Asia, enclosed in walled compounds that were protected from local taxes in an effort to lure the big name "investors". These "export processing zones" or "free trade zones" were impenetrable to outsiders and short on inspectors. The labor, usually teenage girls and young women, were kept intimidated to discourage labor unions from forming. And it wasn't' just clothes, it was everything consumers might buy. Catherine wanted her own Kleen Kanteen, the stainless steel water bottle that had become the hallmark of environmentalists. It was made in China. I asked the sales rep about the factory that made these bottles. Were they sweatshop free? She did not have a definitive answer. They had given their contractor the sweatshop free guidelines they wanted in a factory, but they could not report having inspected the factory themselves and were continuing to seek transparency. Well, at least they had guidelines. The clothing companies I talked to were better. Their factories were registered fair trade operations. Other vendors like To Go Ware had sought out Burmese refugees on the Thai border to make their portable bamboo flatware and lunch containers and had a personal relationship with them. At the add-on bidet booth, I wanted to tell them that all that hardware needing to be plumbed into an existing toilet was way too complex a solution just to save toilet paper (and the Boreal forest) when we could use one of our old plastic sports bottles that we now had no use for, having replaced them with the Kleen Kanteen. I had been inspired by the bidet idea last year and had come up with the sports bottle alternative, but there were too many people hovering around their hardware-bedecked toilet for me to attempt to derail them. "I'm worried about the plastic bottle," I told the young woman at the Dr. Bronner's soap booth. The characteristic bottle, with its famous label covered with health tips and Bronnerisms, was 100% post-consumer PET, she told me, a technology the company had been a pioneer in getting started. I hadn't believed it was possible to make bottles with 100% recycled plastic; I had read that the polymers break down when reused. Good for them if they have figured that one out. They were local too, being in California. The Green Festival wasn't doing a whole lot about curtailing overseas shipping, but it was improving working conditions of workers and the environmental impact of consumers. Thus it was our annual shopping go-to event for socks, underwear, soap and hats. And food for thought. This year I was eager to hear Antonia Juhasz. 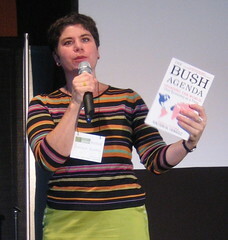 Before reading her book The Bush Agenda: Invading The World One Economy At A Time, I thought of the Iraq war as a mega distraction on the part of the Bush administration, but her description of the companies profiting from the war made it clear that corporations, mainly Chevron, Bechtel, Lockheed and Halliburton, had been controlling our government long before Bush, pushing the country into policies that had made the world a more dangerous place. But how did the war connect with the green movement? The Bush administration is not leaving Iraq until it has the oil contract it wants, Ms. Juhasz told us. Oil companies used to have control of 80% of the world's oil reserves in the past, but oil producing countries, like Iraq and Iran, had nationalized their oil, leaving oil companies with limited contracts involving production, so of course they want back in. And they want a 25-30 yr. contract that not only gives them the right to control exploration and production of the oil in Iraq, but also gives them the lion's share of the revenues, which would seriously undermine the Iraqi economy. And, what's more, this contract must be underwritten by the US government, which means that our military must remain there to make sure it is carried out. This would amount to an endless war for oil. And, she added, the reason the administration wants to invade Iran is because the current Iranian government has been partnering with China regarding oil contracts and the only way to break up that partnership was to get rid of the government that made that contract. And I thought it was because they, like Saddam, had threatened to sell oil for Euros, which would cause the dollar to collapse. I got my chance to ask her about that during the Q and A. She agreed that this selling of oil for Euros would indeed be disastrous for the dollar, but that it was very unlikely because the oil companies would have to agree to it and so would the Europeans (who presumably don't want to piss off the Americans). I was relieved as I have been spooked about currency collapses since the Asian Tigers went down. It was left to someone else to ask about the green alternative. If this war was about oil, couldn't we simply transform the economy to one that used alternative energy? Her answer was that we cannot create a big enough market as long as we have an oil-dominated system and we cannot legislate alternative energy because the oil companies will outspend our best efforts to put legislation before the public. For instance Proposition 87 which would have funded research for alternative energy with a tax on oil companies as well as reduce oil consumption by 25%, lost last year because of the counter propaganda of the oil companies. They spent more on that California campaign than Kerry did for his entire campaign for president, she told us. So there it was. The oil companies were blocking the green movement altogether. Someone else asked about boycotting oil companies. She said that such boycotts tended to drain activists and are largely ineffective because oil companies have such deep pockets they can wait us out and once you boycott one company what company are you going to buy gasoline from that isn't also involved? You can buy it from Citgo which is Venezuela owned, but they haven't got nearly enough to supply all of us. You could buy it from Valero because they are not involved with production, but then they have to buy it from someone who is. 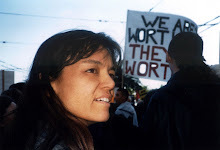 Her proposal was that we must insist that the oil companies be broken up into smaller companies in order to break up their stranglehold on the government. And how are we little people going to do that, another person asked. She assured us that it had been done before by concerned citizens. Yes, we are asking a lot of our citizens in these extreme times. Not only am I compelled to do an environmental impact report on the lifecycle of every item I consider buying, as well as ensure that the lives of those who make it are just, now I must call up my representatives every week and urge them to break up oil monopolies (and stop giving away our civil rights). Couldn't we just undergo a cultural shift? Couldn't this Green culture that we are nurturing here in the Bay Area become part of our cultural pride and identity, that we then spread to the entire state of California? Take the Italians and their love of coffee. So innately informed are they about what coffee should taste like and how it should be sold, enjoyed and drunk, that Starbucks has not dared to open one store in all of Italy for fear of being immediately unmasked. Their faux old-world coffee experience exposed for the dishwater serving, fast food, buzz shops that they are. Starbucks has managed to fool the world, but they know it would only take a few Italians to call their bluff. Oil companies should't be able to outspend us into voting against a tax on them that would fund alternative energy. Their efforts should be immediately apparent for the self-serving manipulation that it is. After my last Green presentation (during which I showed off my new Renaissance vest made from a discarded Chinese dress and invited people to check-out my hair because I was now washing it with baking soda) one of my colleagues told me I was his Green conscience. Another agreed and showed me her refillable water bottle which she had gotten after seeing my anti-bottled water presentation. "You wouldn't be telling us this stuff if you didn't really feel passionate about it," she pointed out. No, indeed, the only way I could live with myself, and continue to face the bad news, was to change the way I lived and share that journey with others. I try to keep it light, but perhaps the Chronicle was not far off in using the headline "heartbreaking". As one activist, teaching about sacred activism, pointed out, "It is in the breaking of the heart that we truly discover what it is we feel compelled to do". There is plenty now to break our hearts, from oil sodden birds nearby to polar bears starving afar. We just have to have the courage to feel it long enough to take action, he counseled. I just returned from a planning commission meeting in Estes Park, Colorado where the commissioners disapproved a proposed condo development in a major elk habitat and calving area. The citizens turned out in unprecendented numbers to speak against the development in a town where any development is very rarely disapproved. Some of the testimony was merely technical and factual; most of the testimony was emotional and heartfelt. Emotion one and caring one, for once. A one shot deal? Or a paradigm shift. We shall see and will try to aid and abet the shift in future matters. This is a conservative town gone soft. My role as an activist is to try to stick with the facts, mam and leave the emotions to others. Now, I'm not so sure. Anyway, thanks for another great article. My family has used Kleen Kanteens for the last couple of years, and we have been very happy with them. I'm disturbed to hear that the factory making them hasn't been inspected for human rights violations and working conditions. If you hear any new developments regarding this, please post it on your blog. I'm going to write to the company about it, too. It might interest you to know that the oil majors now spend more on repurchasing their shares, than they do on new oil exploration. in other words they are getting smaller. It also explains why GM is pushing the Volt concept for the mass market. Thanks David G for that note. Yes the oil companies seem to be at a crossroads. And when there are gasoline shortages, as Mathew Simmons predicts, there will be a much bigger market for electric cars. I like GMs Volt. It's basically an electric car with an onboard gasoline generator, but alas it's not exactly a thing of beauty.